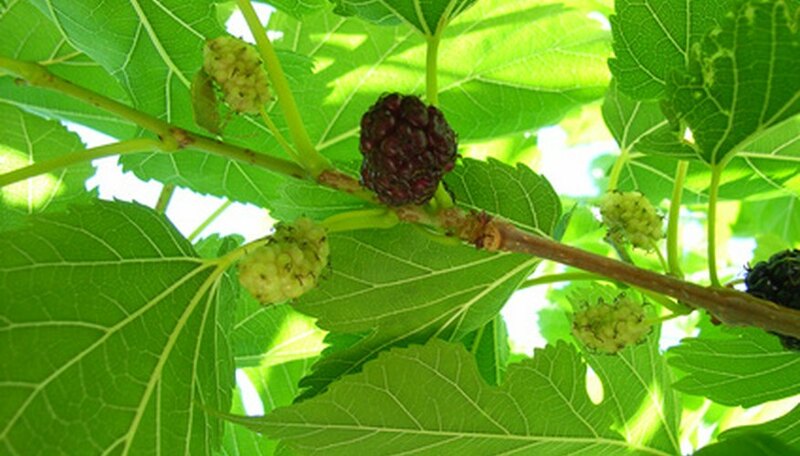 Mulberry, known botanically as the species Morus, are deciduous flowering and fruiting trees. There are two main cultivars, Morus rubra and Morus alba or red and white mulberry, respectively. They are grown for their large leafy shade canopy, for their decorative catkins and for their edible fruit that resemble blackberries when ripe. The fruit are also a desired food source for birds. While not considered particularly disease prone, mulberry trees be susceptible to a range of common ailments that affect broadleaf trees. Sooty canker is a fungal disease known scientifically as Hendersonula toruloidea. It is one of the more common mulberry diseases and creates cankers or wounds in the tree trunk bark and branches and causes the foliage and woody tissues to wilt and then die back. It takes hold in winter but its effects are most pronounced in the summer when brown wet rotting spots appear on the branches, the leaves wilt, the bark splits and splotches of black soot-like mold become visible. When the mold builds up it will kill the surrounding wood disrupting the flow of water and nutrients in the tree and in extreme infestations kill the tree. It is opportunistic and seizes on stressed or weak trees or at pruning wound sites. Armillaria root rot, known scientifically as Armillaria mellea and more commonly as Oak root fungus or shoestring disease, can also infect mulberry trees. The infection is largely internal and underground, rotting out the roots and woody tissues. External evidence comes in the form of shrinking or puny looking foliage, yellowing or browning leaves and unusual or off-season leaf drop. The top branches or limbs will die back and the effects will progress down the canopy. Red to brown mushrooms or fungal blooms can crop up at the base of the trunk or along surface roots which is an indicator of the fungal activity. Bacterial blight, known scientifically as Pseudomonas syringae, can infect the leaves and woody tissue of fruiting mulberry trees. Spotting on the top surface or the leaves with black or brown irregularly shaped lesions, flowers, fruits and catkins and branches can shrivel or die back and the leaf veins can darken in color. Cankers can infect the wood and in severe problems the wood will weep from the canker wound when in moist environments. The prevalence of bacterial blight is spurred on by rain and will be more severe the wetter an area is for sustained periods without intervals of dry conditions.